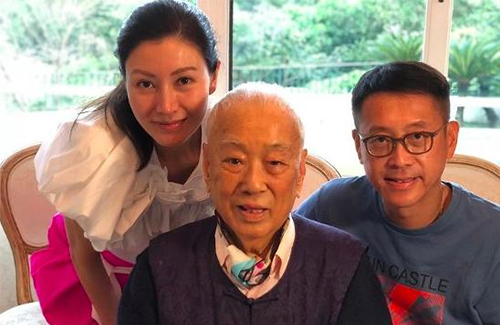 Hong Kong billionaire business tycoon Hui Sai-fun (許世勳), who passed away on December 5, 2018 at 97 years old, left behind a huge fortune of over HK$40 billion. After his eldest son Jenkin Hui (許晉乾) passed away in 2014, the media believed that Hui would pass down that fortune to his youngest son Julian Hui (許晉亨), also the husband of former Miss Hong Kong beauty queen Michelle Reis (李嘉欣). But in a surprise turn of events, Hui had invested all of his fortune in a trust fund instead. According to reports, Julian would only get a portion of the 40 billion—each month, Julian would be get an allowance of approximately HK$2 million from the trust. There are also reports saying that rather than passing down that money to his son, the money would be saved for the descendants of the Hui family. Netizens were puzzled with this revelation, with some joking that HK$2 million a month isn’t even enough for Michelle Reis to purchase a designer bag. Michelle Reis, the first Miss Chinese International winner and 1988’s Miss Hong Kong beauty queen, married Julian Hui in 2008. The couple have one son, Jayden Max, born in 2011. Edit: This article has been corrected from the original, which erroneously stated that the trust fund would go to a “Tsui family” (mistranslated). Who is the tsui family? Trust funds are in general a terrible idea. Too many trust fund baby horror stories. But $2 million a month isn’t something to scoff at. It’s well beyond what’s needed to purchase a bag. Netizens are over exaggerating that too much. Absolutely agree, and it would seem that the patriarch was smart enough to not pass on all that money to Julian cause it would automatically mean that Michelle (Golddigger) Reis would be entitled to half of it…………..and that should not happen………….Golddiggers only deserve to get monthly allowances. @coralie ya, the article can’t bring in a Tsui family without going into details. Is that Jenkin Hui’s wife or gf? First, the context of all the paragraphs leading up to the one that references “Tsui family” makes no mention of anyone else other than Julian Hui, his wife Michelle, the deceased dad, and the Hui family. Second, in other articles, it talks about how the trust fund was set up in a way that each member of the Hui family will be able to withdraw a monthly allowance from it. Am I correct in understanding your statement that “Julian Hui can receive a portion of it monthly from a total of $2 million”? @orchid123 No. It’s saying his “portion” of the total $40 billion inheritance comes in the form of $2 million a month. So he’s getting $2 million a month for life basically…not sure what the other family members are getting but they will have an allowable monthly amount as well. @coralie Trust Fund can be a great thing to secure interest of every one. In this case am sure it came as a shock to the son and wife. Maybe the father felt the son will not manage the wealth well so he decided to give just enough . Anyway must be shocking to them. @funnlim Yup, that’s what it sounds like…the father probably wanted to make sure the rest of the family was guaranteed to be provided for after he’s gone (which might not happen if he gave everything to his son who might squander it and not take care of the other family members outside of his wife and kid). @funnlim @llwy12 in the short run, it might be a good idea, but over time…it’s hard to say. As to trust fund baby horror stories, it’s back to the person itself. A person with bad habit will find a way to support their habits (example gambling/drugs) with or without trust fund. Trust Funds are a good idea, in rhat you can’t squander all the money in one go, esp for younger kids who inherit. – NOT sure how it works in a divorce with Julian Hui. The Huis (esp MIL) have never liked Michelle Reis, who comes across as a shrewd social climber/gold digger. Someone who has hitched up with 大劉 (劉鑾雄) Joseph Lau as his mistress, aggravating his then-wife with Cancer, who passed away. He’s the same one who gave her The One. Among his stable was Choi Siu Fun, Anita Yuen but Michelle lasted the longest – to the pt he was competing with Julian Hui for her attentions. @nomad822 ugly guys like 劉鑾雄 only hook up with beauties and it’s doubtful if those beautiful actresses were attracted to his personality. @nomad822 I must say the senior Hui is one intelligent guy to put his precious billions in trust funds so that the money is in safe hands. Julian’s eldest brother passed away, so that would put julian in favor…but with a wife like michelle, it’s definitely safer to protect the money. she was smooching julian even when he was married to pansy ho. Reminds me of Anita Mui’s mum and her trust fund arrangements. It shows that Julian has not convinced his father that he is not capable to handle the family business. 2 million per month is OK enough, they don’t have to pay rent or Julian will still get a salary of he doesn’t to go work. It is not that bad an arrangement and they won’t starve. But just embarrassing for the trio. Trust funds are not a bad idea if a whole board is in charge of it. I heard that other Hui family members are in on the trust fund board. I guess Mr. Hui senior feels that his fortunes and assets belong to the whole family and not just his own bloodline. I applaud him for that. It’s like an emperor not passing his throne to an incapable heir for the sake of the empire. I wonder if it would still turn out like this if Julian was still married to Pansy Ho. His marriage with Pansy Ho was probably a convenient union between 2 influential families. Afterall the Hui family is one of the Big 4 Wealthy Families in HK – the late dad is on Forbes list. During the time prior to marriage with Pansy Ho = Carina Lau Kar-Leng was also in the picture dating Julian Ho. This was maybe early 90s? Back then, Carina was a 大陆妹 aka ‘China girl ‘ from Suzhou. And Carina didn’t play her cards right. She counted her eggs before they were hatched and declared they were ‘engaged’ – forcing his hand, in a way,. Caina was dropped like a hot potato – no way the Hui elders would have accepted her. @nomad822 Hey! Why I mentioned Pansy Ho is that she has a wonderful relationship with her ex-in-laws and has shown herself to be a capable and ambitious businesswoman. I always feel that if a son is not up to expectations, the daughter-in-law can compensate for his deficiencies with her influence. I wonder if Mr. Hui senior would have reconsidered his financial arrangements if his daughter-n-law was a capable businesswoman rather than an ex-actress with a trail of scandals. In a way, I feel that Carina is not suited for marrying into the upper class. I just don’t think she has the personality and patience to deal with the secret hardships of surviving in the upper class. It was kind of a blessing in disguise since she now found Tony. @elizabeth I agree. if julian was still married to pansy, he would not have put all his billions in a trust. pansy is the daughter of Stanley ho…a wonderful match of the rich families. What a hard life! Only $2 million a month. I’m really worried if they can survive through this lack of pocket money…. @jimmyszeto They’ll probably be living on the streets soon right? Very sad to hear their suffering…. @megamiaow getting $2 million a month is really disgracing the couple. the senior Mr Hui is really shrewd to invest all his money into a trust fund or michelle would have her hands on those billions. Totally. It’s an insult, and a kinda up-yours middle finger gesture from the old man. And now everyone knows what their household income/pocket money is per month. @nomad822 it’s really an insult and embarrassment. Julian’s ex wife must be having a good laugh especially since Michelle broke up her marriage. what I didn’t know is julian is a skirt-chaser and not very capable running a business. This is Avery ksmart move to ensure that his wealth gets passed jonto future generations. They say old money wouldn’t pass through three generations, but I guess it wouldn’t be the case with trust funds as long as there’s no Madoff or simply investing in the wrong stocks…. I think it is also a way for him to ensure that his bloodline carries on as well. It is common in wealth families to give money for barring a son and nothing for a daughter. This is a very smart man to control his wealth and generations after passing. Hkd2 million per month is hardly pittance, they’re not going to be living in hardship.